quantity available – 1 remaining. Call for availability as this is not updated daily. Wholesale carts sold as-is, in running condition. Carts have cargo box (may be taken off and rear seat ut on – we sell for $350 take with) and head and tail lights. Lights may or may not work. 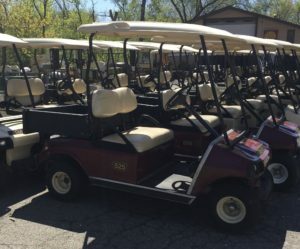 These came out of the rental fleet – bodies are scratched but good running carts if someone is looking for a project cart to redo or if they do not care about some scratches.